Random attempted yoga pose - failure or success ? Not quite sure what I was going for here, but I guess it does look kinda cool. 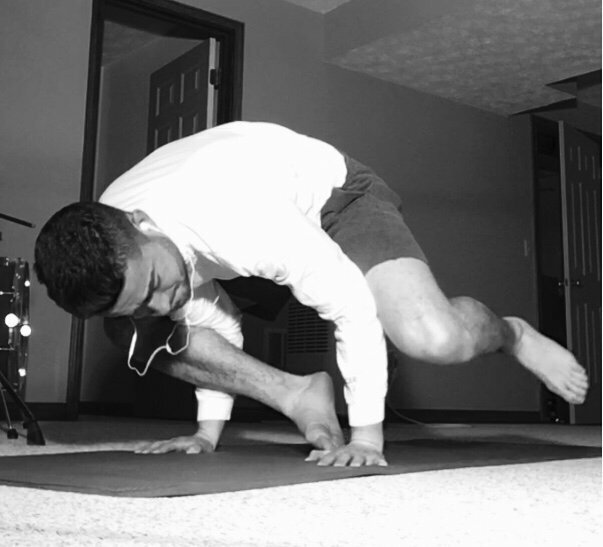 Since both legs are elevated off the floor, it made the pose a little more difficult than if the right leg was resting on the mat. If I could have done something different with the left leg, I think this would have been a pretty killer move. I may have to give this random yoga pose another try to see if I can extend the leg outward, or back behind me. Who’s got a name for this random attempted yoga pose ?? Look like the yoga version of the running man! Hurts me thinking about it! I can see it !! Yeah, this one was surprisingly tough ..
Hi conradsuperb, maybe your position could be called crane 11 because it looks to be one level above crane 1. I am impressed.